Thompson Pharmacy LTC | It's All For You! A paperless pharmacy workflow and document management system that automates order handling and reduces processing time with instant document retrieval. QuickMAR’s electronic MAR is a significant improvement over conventional paper-based systems. Prescriptions, over-the-counter medications and vitamins can be packaged together, organized by day and time of dose in clear, plastic packets. 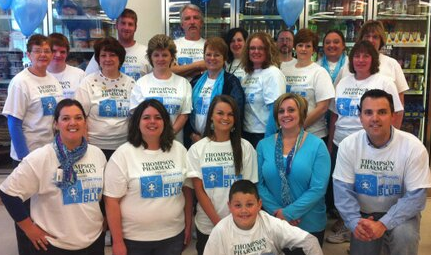 Thompson LTC Pharmacy is a locally owned and operated family business. In 1966, William D. Thompson, Jr. purchased his first pharmacy in the Juniata section of Altoona. Today, Thompson Pharmacy has 4 retail locations in Blair County and a Long Term Care Pharmacy that serves facilities in nine Pennsylvania counties (Blair, Bedford, Cambria, Centre, Clearfield, Huntingdon, Indiana, Jefferson & Mifflin). Thompson LTC Pharmacy, Inc. specializes in quality pharmaceutical services built on one specific idea: SERVICE. Delivery of quality service in a cost-effective manner is the concept on which Thompson Pharmacy has built its business. Through our commitment to service, Thompson LTC Pharmacy has grown to become one of the largest independent long term care pharmacy providers in the state of Pennsylvania.